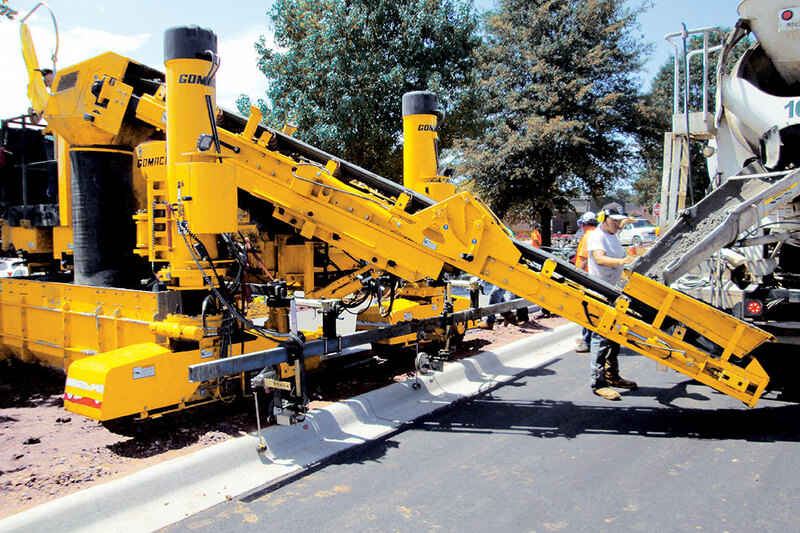 Curb Time Solutions were attracted to the GOMACO 3300’s versatility and ability to slipform multiple applications from either the right-side or the left-side. Curb Time Solutions in Russellville, Arkansas, is a family company. Hannah Bowden is the owner of the company and her father Jim, and brother James, each play crucial roles. Jim has worked behind concrete slipform machines most of his life and knows the intricacies of concrete very well. 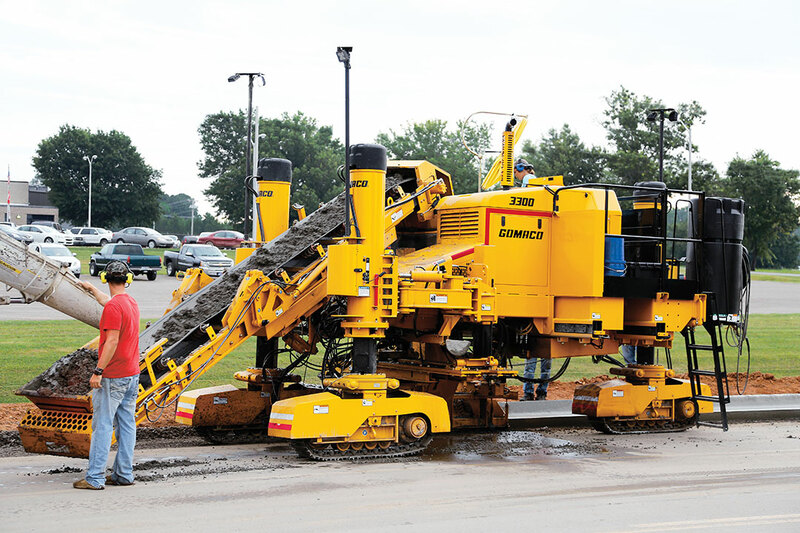 When it was time to order a new concrete slipform paver for Curb Time Solutions, which specializes in commercial concrete and heavy highway work, the company purchased a new GOMACO 3300 and Hannah’s dream of running her own slipform paving company began. Jim had the opportunity to visit Diamond Materials’ job site in Cranbury, New Jersey, and watch their new 3300 at work pouring 18 inch (457 mm) tall stand-up curb. That visit was followed up with more discussions at World of Concrete in Las Vegas, Nevada, and it was there the decision was made for Curb Time Solutions to purchase the new paver, complete with both curb and gutter and sidewalk molds. Curb and gutter and sidewalk were Hannah’s first concern. 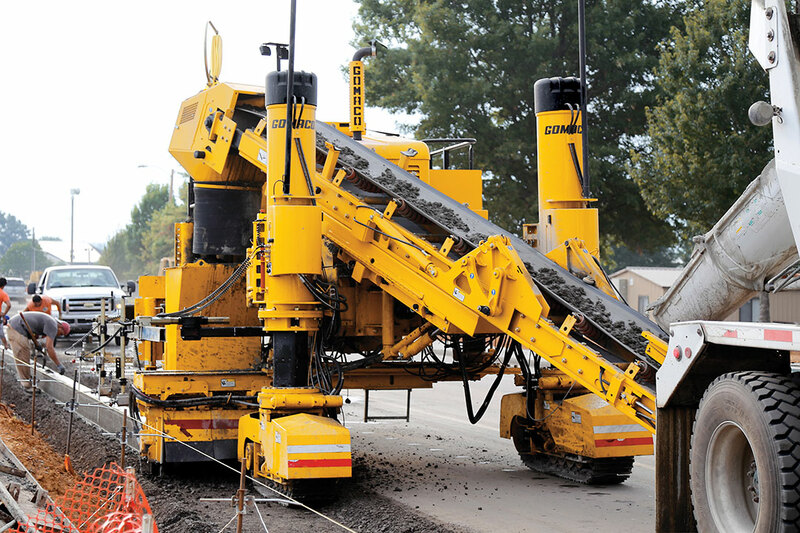 The new 3300 was put to work on a project in Clarksville, Arkansas, with 15,600 feet (4755 m) of two different types of curb and gutter, as well as 8200 feet (2499 m) of 10 foot (3 m) wide sidewalk. Hannah, as the operator, her chute person, and her father Jim all wear headsets on site. The headsets allow for easy and instant communication between the key people while pouring. Another piece of technology incorporated into their projects is a drone with video camera. Her brother, James, is the drone pilot and he flies the drone around all of their projects recording site conditions before work begins. Then, if questions arise later, they have video proof showing the beginning condition of the job site. The drone is also a handy tool for tracking progress on their projects. (A video James produced on Hannah’s first 3300 pour can be watched at https://www.youtube.com/watch?v=UiG53SYI0Ak). It would be Hannah’s first time operating the new 3300 and putting concrete through the paver. In preparation for the first pour, Jim had created a practice course at home and evenings were spent teaching Hannah the fundamentals of operating the 3300 with its G+® control system. Hannah was provided additional support from the GOMACO’s service representative who was on-site during the first week of paving. Summers are extremely hot and humid in Arkansas. To compensate for the heat index, Curb Time Solution’s crew would sometimes start their day’s pour at 4 a.m. 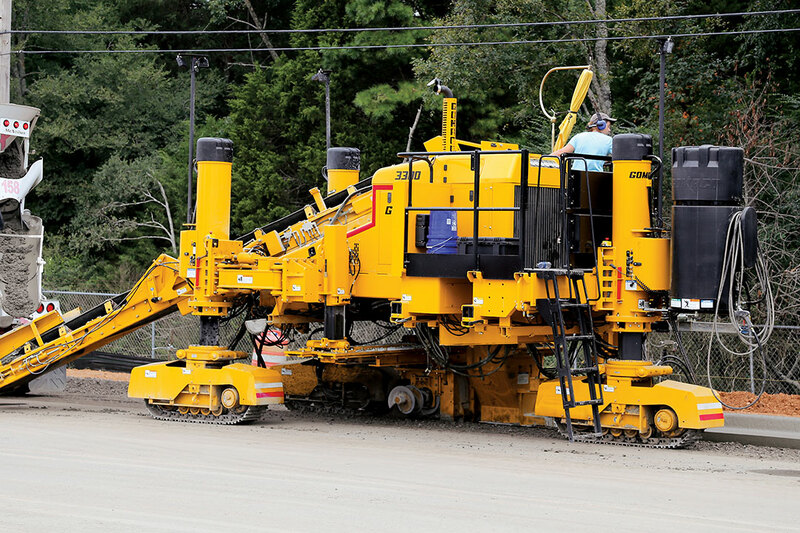 The 3300 with its symmetrical configuration has been designed to be a right-side and left-side pour capable paver. 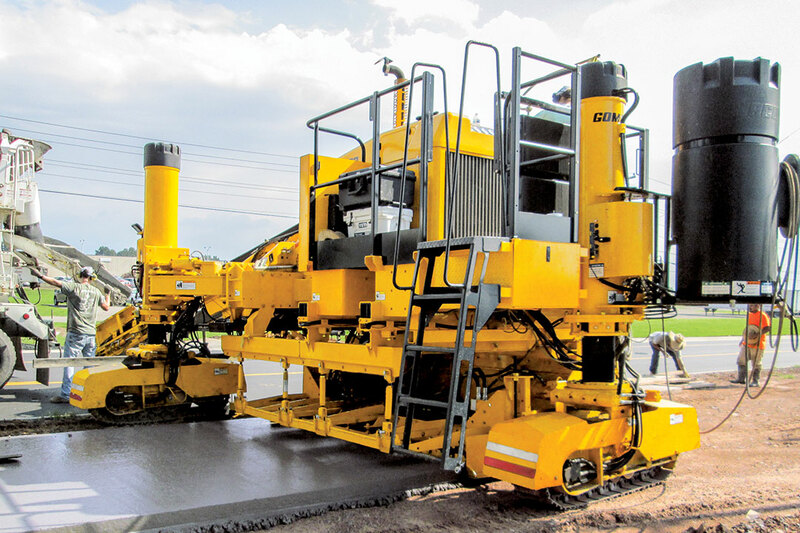 It has a U-shaped operator’s platform for complete visibility of the paving process. They immediately put the 3300’s right-side pour capabilities to the test on the first day’s pour. Hannah equipped her 3300 with a 20 foot (6.1 m) long folding conveyor. The conveyor features hydraulic slide, tilt and pivoting adjustments to allow ready-mix truck positioning on either side of the paver. The tracks of the 3300 are equipped with rotary-sensored slew drives for Extreme Steering capabilities and Sensored Radial Steering for automatic directional control. The profiles on the project are Arkansas State Highway and Transportation Department (AHTD) standard designs. The curb and gutter is 18 inches (457 mm) wide with a six inch (152 mm) tall curb. The roll over curb and gutter profile is 24 inches (610 mm) wide with a 4.75 inch (121 mm) tall rolled curb. Her 3300 is equipped with the 20 foot (6.1 m) long folding conveyor. The 3300’s conveyor features four-way hydraulic positioning, for loading the hopper on either side of the paver. With Hannah comfortable on the fundamentals of slipforming curb and gutter, it was time to master 10 foot (3 m) wide sidewalk. The curb and gutter mold, along with the hopper and trimmerhead, were removed. The 3300 was put into the transverse position so the mold could be centermounted underneath the paver. Grade and steering was referenced off the new curb and gutter. The G+ control system was set to pave in the transverse right configuration. The 3300 is referencing grade and steering off the new curb and gutter with the G+ control system set to slipform in the transverse right configuration with the undermounted sidewalk mold. Curb Time Solutions centermounted a sidewalk mold under their GP3 to slipform 10 foot (3 m) wide multi-use trail for bike riders and walkers. The sidewalk mold is sectional and built to be open front or closed front depending on job-site requirements. The mold has adjustable sideplates with up to eight inches (203 mm) of adjustment on either side. Ready-mix trucks dump directly onto the 3300’s conveyor which moves the concrete into the hopper of the mold. A cross auger inside the sidewalk mold moves the concrete across the 10 foot (3 m) width. The city of Clarksville is putting in approximately 10 miles (16 km) of new multi-use trails for walkers and bikers. The trail is slipformed with a cross slope and joints are every 10 feet (3 m). Expansion joints are saw cut in the next day at 50 foot (15.2 m) intervals. Hannah learned the fundamentals of the 3300 and slipform paving in her first season as an operator, while also owning her own slipform paving company. Finding an easier way included a trip to GOMACO University this winter for a week-long course in Ida Grove, Iowa. Hannah, Jim, and her company mechanic were all in attendance learning the finer details of the G+ control system and the 3300 in the classroom, in the hands-on shop time, and from fellow University students.